We are St. Louis Wildlife, Inc. a full-service wildlife removal company servicing the greater Saint Louis MO area. We resolve conflicts with unwanted bats. When Can You Solve My Bat Problem? Common problems caused by bat include: a large colony of bats roosting in an attic, and the large amount of guano that they can leave behind. 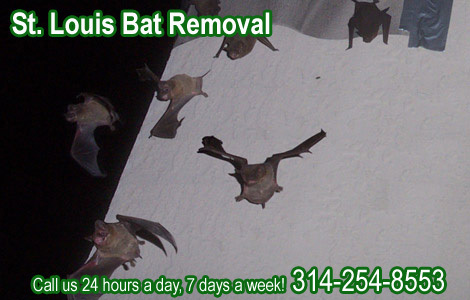 Our company specializes in wild animal control, including St. Louis bat removal. We are not a pest control company, or an exterminator. We deal strictly with wild animals. We are also not the Saint Louis county animal control, and we do charge for our services. Why do bats like to live in buildings? What do we want in our homes? We want somewhere nice and warm so that we can be sheltered from the cold, rain and snow as well as other weather that may hit us. We also want someone nice and comfortable so that we can raise our young. Guess what – that’s pretty much what most animals are looking for too. When you add to the fact that a nice, comfortable home usually means a steady source of food nearby, and a place to hide from other animals and threats, you pretty much have a match made in heaven – the perfect home for living and perhaps starting a family. Bats are looking for exactly the same things that you are looking for. They want exactly what you want out of a home. Unfortunately for you, this often means that your nice, cozy little house will become the new home for the bats too. You will spot the bats flying in and around your home at dusk and dawn usually as they are nocturnal creatures. When the sun goes down at night, the bats start to fly out of the roost that they will probably share with plenty of other in the colony if they are females. The male bats tend to be more solitary in nature, preferring to sleep alone usually in the cover of trees. The women form a sort of babysitting club, however, with them often choosing to have their babies in these nice, warm conditions, surrounded by likeminded females. Once they have left the roost, they will often go in the hunt for water before they search out their feast. If you find a colony of bats in your attic, there is a good chance that you live somewhere close (ish) to water. They will be attracted by the glistening fluid itself, but more so to the mosquitoes and other flying insects that live in the area. They also love to eat beetles and moths too, in fact; most flying insects will do. Once they have had their fill of the drink and food set out in front of them, they will return to the roost to have a small nap before venturing out and repeating the same thing over and over again, often multiple times in any one night. As well as giving the bats a source of food and shelter from the elements alongside somewhere nice and warm to raise their young, your home will also provide these bats with the shelter they need to avoid becoming prey to other predators. This means that their young will be kept safe at the same time and that is the whole point of being an animal – to play your role in life and reproduce. If your attic tends to get very warm in the hotter, summer months, there is a good chance that you are pretty much attracting the bats. They have a tendency to opt for the nicer, warmer temperatures and it is often found that they thrive in such areas. Just like you want a home that is warm, dry and free from threats, so do the bats especially when they have a brood of young to take care of at the same time. We may have evolved further as humans but our basics are the same and tend to go hand n hand with many of the same basics that the wild, animal world needs in order to flourish. As nice as it might be to provide a comfortable home for a wild animal, it might just be time to start thinking about bat-proofing your home.